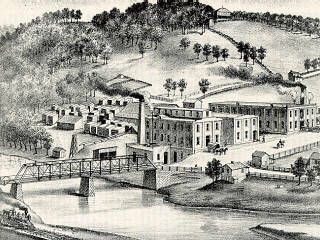 The Freeport Planing Mill Company was incorporated in 1875 with capital of $20,000, divided into shares of $100 each. This company erected--upon the site of a planing mill owned by W. P. Murphy & Co., which had burned down that same year--a substantial brick structure, 50 X 100 feet, with engine-house attached. The establishment was leased in 1879 by Murphy, McCain & Co. They ran, in connection with their planing mill, and sash and door factory, a sawmill, which handled annually between five and seven million feet of lumber. The site also included a warehouse, two stories in height and 30 X 60 feet. They fueled the boilers in the planing mill with natural gas from a well near at hand. The Buffalo Milling Company, composed of a majority of the original stockholders of the Freeport Planing Mill Company, and some others, was incorporated in 1881, and commenced business in September, 1882, in a building erected for the purpose, which was 40 X 65 feet, and three stories and basement high. There was an engine-house attached, of which the dimensions were 25 X 40 feet. The manufacture of flour was by the Hungarian roller process, and the mill had an exclusively merchant patronage. Its capacity was about 125 barrels of flour per day. Devereaux Chevrolet/Geo now stands on the site, and the basement section of the flour mill has been incorporated into the the building currently occupied by the dealership. Below, we compare photos of the walls as they exist today with the drawing from Smith's History of Armstrong County from 1888. 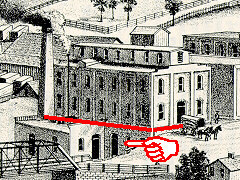 This detail from the drawing above shows the basement area of the Buffalo Mill (below red line and excluding the engine-house) which still exists within the site's present structure. This arched doorway is visible in the 1888 drawing, indicated at left by the pointing hand. Note the thickness of the walls--about two feet. Unlike the dressed stone seen in the photos of the door and window, this wall of field stone was the east basement wall, which was built along an embankment and was not visible from outside the building. This window (now a small cupboard) in what would have been the old mill's north wall isn't visible in the 1888 drawing, but it appears to be identical to the windows on the upper stories on the front of the building (south wall) as seen in the drawing.